One of the leading figures of Soviet unofficial art, Oleg Tselkov developed a distinguished and immediately recognisable artistic language, in spite of the constraints of the oppressive autocratic regime, and continued to mature in the Soviet Union and during his semi-forced immigration to France in 1977. As the artist recounts: ‘I proved to myself and to others that even under totalitarian communist pressure one can preserve one’s courage, individuality and do one’s work in keeping with one’s own preferences and taste. Although a whole system was created to prevent the appearance of individuals like me, not only I existed, but I had held out. And I was not the only one’ (quoted in Y. Aleshkovsky et al., Tselkov, Milan, 1988, p. 293). Tselkov actively participated in the artistic life of the underground, however he rarely showed his works with his contemporaries at nonconformist exhibitions that would take place in private flats, research institutions and culture houses. He did not, for example, participate in the famous “bulldozer” exhibition nor in the following exhibition at “Izmailovo” in the 1970s. Tselkov’s artistic formation began with his enrolment at the Moscow Secondary School of Art, run by the Academy of Arts. Following graduation, he failed to pass the exams for the Surikov Art Institute and moved to Minsk to study at the Art Institute. The artist recounted that he experienced trouble there with the local authorities and was expelled. The following autumn he began his studies at the Repin Academy of Arts in Leningrad in 1954, which too led to expulsion. Finally, he was able to secure a place and successfully graduate from the Leningrad State Institute of Performing Arts, where he studied under an experimental theatre director Nikolay Akimov (1901-1968). In several interviews Tselkov admits to a number of influences on his artistic language; in particular, Kazimir Malevich’s works of the 1930s, Léger, Rembrandt, Bacon, Orozco, Rivera, and the Surrealists. The influence of the theatre has been equally significant. The artist considers the year 1960 to be a turning point of his career; it marked the beginning of his first series of ‘portrait’ paintings, with deformed human faces, resembling masks appropriated from Commedia dell'arte and painted in vivid fluorescent colours, primarily on large-scale canvasses. They are portraits of ‘unknown persons’ according to the artist, yet on some level there is a certain resemblance, a certain familiarity, which leaves the viewer with a sense of the uncanny. In an interview during his 2004 exhibition with the State Russian Museum in St Petersburg he was quoted, ‘I painted a kind of portrait; this was not a portrait of some definite person, but of everyone in one face, and awfully familiar’. The 1960s were also consistent with Khrushchev’s ‘thaw’, which led to a certain relaxation of the intensity of the repression and censorship in the Soviet Union. During this time, American playwright Arthur Miller (1915-2005) travelled with his wife, the photographer Inge Morath (1923-2002) to Moscow. Miller was President of PEN International at the time, an international literary organisation formed to defend free expression and protect writers from oppression. Having always been committed to this cause, Arthur Miller had written and acted tirelessly against censorship. Arthur Miller was one of the earliest and dedicated supporters of the outspoken and controversial poet Evgenii Evtushenko (1933-2017). He met with him in Moscow and through him was introduced to Oleg Tselkov. In Ilia Falikov’s 2014 biography, Evtushenko: Love story, in a chapter titled ‘The Cut Watermelon’ the famed poet describes this encounter between himself, Arthur Miller and Oleg Tselkov, in the latter’s studio. Evtushenko had just returned from a censor with his famed poem ‘Bratsk Station', which was about to be published. He showed the text riddled with red marks to Miller; ‘When in 1964 in the studio of the artist Oleg Tselkov I showed Arthur Miller the layout of the poem, dotted with red pencils, he was shocked: How can you write in such conditions? What kind of people torment you in this way? I showed him the picture of Tselkov, where the smug creatures shredded the living body of a cut watermelon with knives’. (quoted in I. Falikov, Evtushenko: Love story, Moscow, 2014). 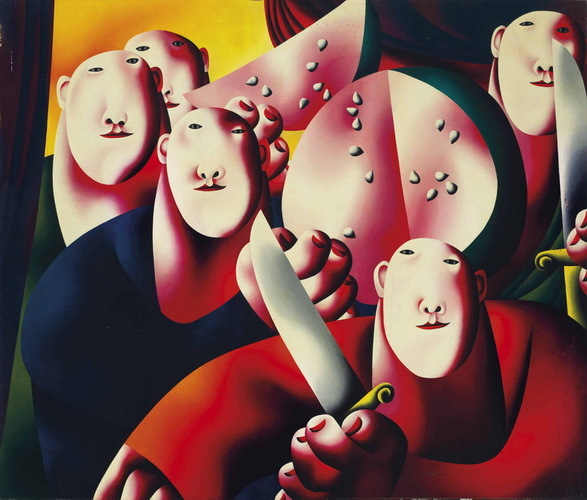 Tselkov’s striking painting Group portrait with watermelon is a powerful example of the artist’s way of presenting violence using tools of the theatre; incorporating the masks inherited from the Commedia dell’arte in this brightly coloured image, these dim, yet self-satisfied figures have impounded and slashed open the flesh of a watermelon, the image of which has traditionally often been used in Russian art and literature, having long been considered a prized fruit. Tselkov’s group portrait appears quite joyful, yet one also senses a deeply disturbing element in the scene. This was not only a commentary on censors and other Soviet oppressors, but a depiction of a very real duality that is present in all human beings. Arthur Miller was immediately taken with this painting and wished to acquire it. Thus followed a few negotiations with Evtushenko acting as intermediary. Miller paid the artist for the painting, but left Russia without the work, comforted by the hope that the funds would provide the artist with the support that was much needed at the time. Over a decade later, Miller recounted that one day in he received a phone call at home. The very low voice on the other end stated, ‘I have your painting’. Acknowledging the transaction that had occurred years earlier, Oleg Tselkov committed to deliver the painting to its owner and brought the work to the Millers’ Roxbury, CT home. Arthur Miller installed the work in his study, where it remained, greatly admired for years until this sale. Prior to Miller’s acquisition of the work, this important painting was included among the work of other Dissident artists in the 1977 Venice Biennale, which was dedicated to ‘Dissent’. The work inspired numerous Soviet dissident poets and intellectuals, and was illustrated on the cover of Tretya volna (no. 5, 1979), which was a leading journal produced by the Third Wave publishing house founded by Alexander Glezer (1934-2016) in Paris in 1976. Arguably the most important painting by the artist to come to auction, Christie’s is honoured to offer this work for sale. E. Crispolti and G. Moncada, La nuova arte sovietica: una prospettiva non ufficiale, La Biennale di Venezia, Padua, 1977, illustrated and listed p. 153. ‘Tret'ia volna [The third wave]’, Paris, 1979, no. 5, illustrated on the cover, listed opposite the title page. Y. Aleshkovsky et al., Tselkov, Milan, 1988, illustrated p. 41, listed pp. 40 & 297, no. 7. P. Turine, Oleg Tselkov, Moscow, 2002, illustrated p. 25. F. Komorav, L. Kashuk and O. Shikhireva, Oleg Tselkov, St Petersburg, 2004, illustrated p. 12. Venice, La Biennale di Venezia, 1977, no. 45 (label on the reverse). Acquired from the above by Arthur Miller (1915-2005).